In 2001, Columbia Audubon Society (CAS) received a donation of 22 acres now known as the Columbia Audubon Nature Sanctuary (CANS). Originally donated as an inducement for the National Audubon Society to select Columbia as the location for a nature center, the future CANS property sat idle while National deliberated. Eventually National Audubon selected Joplin, not Columbia, for the site of the nature center. At that point, CAS began to make its own plans for the property. Its development began in earnest during fall 2012, when a small parking lot was constructed. The property’s initial trail was designed as a half mile loop, beginning and ending at the parking lot. Over time, trail spurs were added to improve access to the adjoining city-owned Bonnie View Nature Sanctuary. A “short cut” was added up the west side hill, then another spur was added to access Scott’s Branch Trail’s board walk. Trails invite hikers, and hikers appreciate well-maintained trails. That brings us to Dean Ravenscraft. A number of years ago, Dean was employed by Columbia’s Parks and Recreation department. At that time he met CAS member and volunteer Cleo Kottwitz, who was looking for someone to mow the less-than-half -mile trail at CANS. Dean volunteered; it was his way to give back to the community. 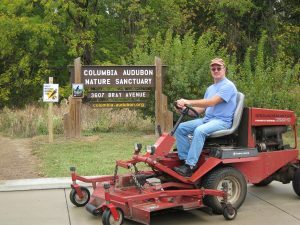 Since he worked in Columbia, he could bring his mower (affectionately named Big Red) with him when he came to work so he could do the mowing after quitting time. Keep in mind, at that point, there was only the half-mile loop. Fast forward to 2017. Not only have more trail spurs have been developed, in 2013 six acres were added to CANS and a figure eight trail loop was created on the west side of Scott’s Branch Creek. All of these trails, short cuts, spurs, and figure eights need to be mowed to maintain public access. What began as less than a half-mile is now approaching 2 miles. Oh, did I mention there are plans to create yet another loop? This will begin at the CANS trail head and extend east through the Bonnie View prairie. Dean, who lives near Fulton, is now retired. Throughout all these changes, Dean willingly and cheerfully mows wherever the trails lead him.